Polycaprolactone (PCL) is a biodegradable polymer used in many FDA approved implants, drug delivery devices, sutures, as well as for a wide variety of applications in tissue engineering research. These applications include: Bone/Cartilage, Cardiovascular, Nerve, Skin, Tendon/Ligament, Liver. Our 3D InsertTM-PCL scaffolds are prepackaged into wells of tissue culture plates and terminally sterilized using γ-radiation. 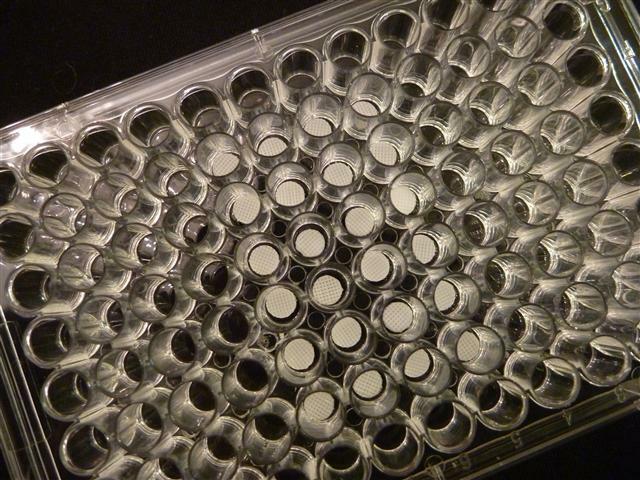 Currently our PCL Scaffolds are available in prepackaged tissue culture plates ranging from 6-well to 96-well plates. Cytotoxic organic solvents, such as chloroform and methylene chloride, are often used in fabricating PCL scaffolds. 3D Biotek’s precision micro-fabrication technology is a solvent-free manufacturing process. Therefore, the 3D InsertTM- PCL is free of organic solvent. The size and configurations of 3D InsertTM - PCL can be customized to fit into the bioreactors of your choice. Introducing 3D Biotek's new 3D InsertTM PCL scaffolds for large scale 3D cell expansion! Compared with traditional 2D culture, 3D InsertTM PCL technology more closely resembles an in vivo environment. Cells expanded on our 3D scaffolds have more physiological-like morphology and function, thereby providing you with higher quality cells to use in your research. Combine 3D InsertTM PCL quality with the time, money and space you will save with this technology, and you will see that there is no other choice for 3D cell expansion. Ultimately, the 100 mm compatible 3D InsertTM PCL will save you money on expensive media and supplements; it will reduce your handling time, and it will save space in your tissue culture incubator. Each 100 mm dish contains a polycaprolactone (PCL) scaffold with a fiber diameter of 300 µm and a pore spacing of 300 µm. Our 3D InsertTM-PCL 96-well compatible scaffolds have been selected as standard 3D tissue culture scaffolds by the National Institute of Standards and Technology (NIST). The same reference material is used in 3D Biotek's novel 100 mm 3D InsertTM-PCL Dish!